One of Japan's little cooking miracles--if you like rice--is the rice cooker. It's a fire-and-forget solution to the staple food of Asia: No more waiting for water to boil on the stovetop. No more setting timers to make sure your rice doesn't under- or over-cook. No more burnt rice stuck to the bottom of the pot or trails of white rice-residue to scrub off the side of your pot and off of your range. So, what to these all do? 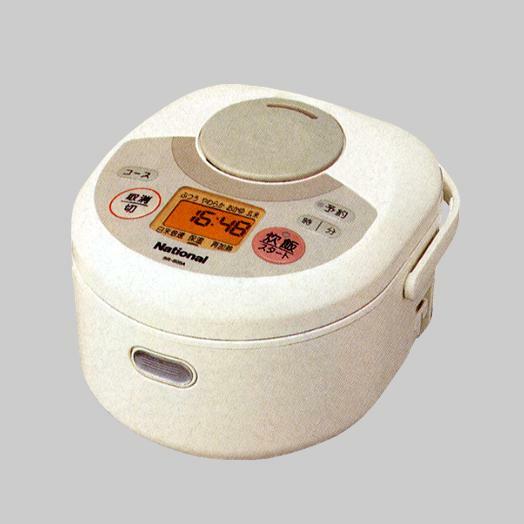 炊飯 (suihan): The genesis of the word 炊飯器 (suihan ki), or "Rice Cooker." Everyone seems to remember that word, but this shorter and very similar word gets left in the dark. It just means "cook rice." Once you have measured your ingredients, sealed the lid, and are happy with your settings, you push this button to make it happen. In most designs, it's a red button with a red light. 保温 (ho'on): This button means "hold temperature." 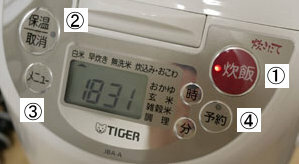 It is the mode that automatically engages when the rice is finished cooking. It keeps the rice hot if there is any leftover in the pot. In most designs, it has a yellow light. If the 保温 button is engaged, and you push it again, it turns the 保温 function back off. That's what 取消 (torikeshi), seen in this particular picture, means: "cancel" or "turn off." 白米 (hakumai): This is the default setting and the one most people cook with. It's for the normal white rice you buy in a bag at a Japanese supermarket and rinse once or twice before cooking. The rice takes about 30 or 40 minutes to cook and turns out fluffy and sticky, just how Japanese people like it. お粥 / おかゆ (okayu): This is like rice porridge and is the Japanese equivalent to "chicken soup;" sick Japanese kids at home from school get a bowl of this for lunch. Be careful: The water-to-rice ratio is different for making okayu; it should be marked out on the teflon coated pot that goes inside your cooker. A cooker that can normally handle 3 "cups" of rice can usually only fit one or two of okayu. 玄米 (genmai): This is the Japanese word for unbleached Japanese rice. Genmai takes extra time to cook, so this setting is actually necessary to make a good bowl of genmai. You can also use this setting for wild rice or Western brown rices. 予約 (yoyaku): This is for scheduling rice to cook in the future. You can wash a cup of rice and put it in the cooker, then set the timer so the rice is done when you wake up in the morning or get home from work. Make sure that the clock on your cooker is set to the right time. If you don't have plus or minus buttons like the cooker in this picture, then one of the other buttons will temporarily act as a clock control when you are in 予約 mode. Some other tips to keep in mind when dealing with Japanese rice cookers are that rice in Japan is measured using a traditional unit system: One "cup" of rice in a rice cooker is actually 一合 (ichi gou), which is equivalent to about 180ml of dry rice. It is not the same as 一カップ (ichi kappu), "One cup." Learn more about Japanese cooking measurements here. Also, a fair number of Japanese enthusiasts experiment with cooking things other than rice inside modern rice cookers. For example, it is perfectly possible to make (thick) pancakes and birthday cakes within a rice cooker using the proper recipe. this was super helpful- thanks heaps!